Remember how I said that the downside to Art Jamming is not know what to do with your finished work? 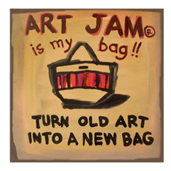 Well I guess Art Jam saw the post because this week, they are inviting all past participants of Art Jamming to bring in their masterpieces and have them made into tote bags. I must admit I’m very tempted to bring in that painting I’ve got hanging over my wall since 2007 and making it more usable. After all, we all need a tote bag no? Especially now that we don’t get plastic bags (which is a pet peeve for another day.) 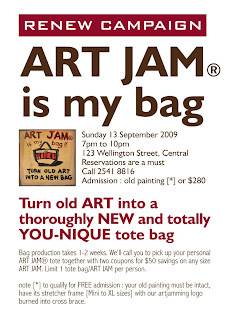 Anyway, the only criterion for participating in this Art Jam Tote Bag event is to have your old intact painting. And if you’re hitting yourself on the head for passing up on all those opportunities to Art Jam, no worries, for HK$280, you can create your own painting that day and have it made into a tote. More details after the cut.